It’s not often I watch a movie that feels like it was made for me. Boy Erased is such a movie. Based on a memoir of the same name by Garrard Conley first published in 2016, Boy Erased tells the story of a teenage boy in a devout Baptist family who comes out as gay to his parents and is then enrolled in a conversion therapy program to cure him of his attraction to men. What’s surprising about this film is how it sensitively balances the opposing views of open homosexuality and fundamentalist religion. (Nobody is painted as a 100% villain or nefarious tyrant.) And this sensitive balance will help audience members of all backgrounds gain a bit more understanding, a bit more empathy, for a perspective different than their own in this trying and polarizing subject. 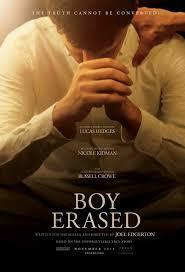 Boy Erased is a tear-jerker mainly through the leading performance by Oscar-nominated actor Lucas Hedges (Manchester by the Sea, 2017) whose star is continually rising. Hedges’ acting is so emotionally articulate mixing shame, anger, hope, and fear. His brilliantly vulnerable performance encapsulates so much about how it feels to be gay with a religious Christian background. Oscar will surely be calling his name again as a nominee. The screenplay is carefully adapted from a beautifully reflective and wistful memoir, making this family drama and coming-of-age journey one of the best films I have seen this year. At this time of year marked with family togetherness and celebration, Boy Erased is a much-needed reminder of acceptance, support, and love.